Prior Lake got a blowout win against Eagan and will now turn its attention to the big rivalry game against Lakeville North at TCO Stadium. Wide receiver Spencer Marlier caught eight passes for 136 yards and two touchdowns as the Prior Lake Lakers rolled to a 35-0 win over the Eagan Wildcats Oct. 5 at Eagan High School. Marlier’s first touchdown was an explosive one. After the Laker offense picked up a pair of first downs on its opening drive, they faced a second-and-15 from the Laker 45 yard line. Quarterback Colin O’Connor found Marlier on a quick slant, who weaved his way through the Eagan secondary and used his speed to outrun defenders all the way to the end zone for a 6-0 Laker lead. 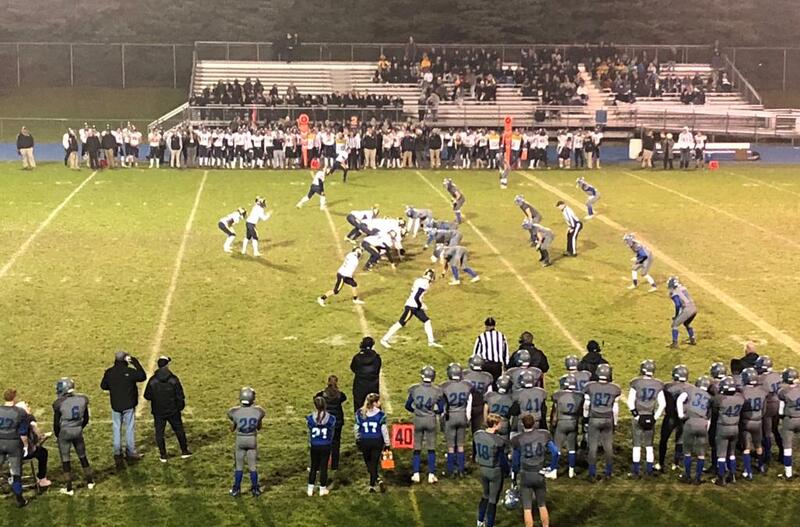 The teams exchanged defensive stops on the next few possessions until the Lakers gained good field position at the Eagan 41-yard line early in the second quarter thanks to a short punt. O’Connor connected with Marlier deep down the middle of the field on the next play for a 29-yard gain. The drive stalled when running back/linebacker Spencer Shaver was stopped just short of the first down marker on a fourth down run. The next drive started perhaps the strangest sequence of the night. Eagan fumbled on the very next play to set the Lakers up with first-and-goal but the Prior Lake offense could not capitalize, turning the ball over on downs. Eagan then fumbled again on next play, giving the ball back to Prior Lake. Shaver ran the ball into the end zone from 11 yards out on the ensuing play. Receiver Nick Theis completed a pass to receiver Parker Ellis for the two-point conversion to extend the lead to 14-0 Lakers 5:37 before halftime. Yet another stop by the Laker defense and a good punt return by Jackyse Jacox set Prior Lake up already in Wildcat territory at the 46-yard line. Four plays later, running back Keaton Schroeder took a handoff from O’Connor, broke a tackle near the line of scrimmage and took off down the Laker sideline, following his blockers into the end zone for a 35-yard touchdown. Kicker Mike Nelson’s extra point was good to push the lead to 21-0 with 1:51 left in the half. The Lakers then forced a three-and-out and coach Matt Gegenheimer used his timeouts to conserve time. A bad snap on the punt set the Lakers up at the 24-yard line. A completion on a screen pass to Schroeder got Prior Lake inside the 10-yard line on the next play. O’Connor found Marlier in the end zone for his second touchdown on the ensuing play, making the score 27-0 at the half. Prior Lake put the game away on the opening possession of the second half with a 12-play 62-yard drive capped by 23-yard touchdown pass from O’Connor to Theis, who caught the ball while in a slide in the middle of the end zone. Ellis ran in the two-point conversion to reach the final score 35-0. Offensively, O’Connor led the Lakers, completing 17 of 25 passes for 209 yards and three touchdowns. Schroeder was the leading rusher with 63 yards on 10 carries. Defensively, Shaver led the team in tackles with eight. Linebacker DJ Doyan had seven tackles while linebackers Noah Benson and Tanner Newlin each had six. The Lakers now shift their focus to familiar rival and top-ranked Lakeville North, who they will take on Oct. 12 at TCO Stadium in Eagan. TCO Stadium is part of TCO Performance Center, the new training facility of the Minnesota Vikings. Apart from the hype of the special venue for the matchup, the game itself could be one of the best of the year considering both teams are among the best in the state who are battling for a district title and section playoff seeding. The Panthers (6-0) enter the matchup ranked first in the Star Tribune’s Oct. 10 Class 6A Rankings while the Lakers (4-2) come in ranked eighth in the same poll. The clash between the teams has been referred to as the “Blue Collar Bowl” since the lead up to last year’s matchup, an 8-0 Prior Lake win at Lakeville North High School. Lakeville North is coming off a 33-18 win over Maple Grove in Week 6. They also have key wins over Wayzata 42-13 in Week 5 and perennial power Eden Prairie 14-0 in Week 2. Statistically, the Panthers are led by running back Brian Curtis Jr. who has already rushed for 1,105 yards on 147 carries and 12 touchdowns this season. Wide receiver/defensive back Raja Nelson has been a threat in the run game as well with 40 carries for 301 yards and six touchdowns, while also catching 13 passes for 260 yards and four touchdowns. Quarterback Brennan Kuebler leads the passing attack, having completed 32 of 56 passes for 484 yards and five touchdowns along with three interceptions. Kickoff against Lakeville North on Friday is scheduled for 7:30 p.m. at TCO Stadium in Eagan. Tickets to the game are now sold out. Parents and families who reserved tickets can pick them up at the PLHS activities office. If you can’t make it to the game, the game will be broadcast on TV on Fox 9+ (channel 9.2) and heard on the radio on KFAN plus (96.7 FM). Details about other ways to catch these broadcasts will likely be posted on Twitter in the coming days. If you prefer, you can watch the usual online video stream with Ben Tressel and John Wahlstrom. Follow @plhsfootball, @pl4lstreaming and @pllakers on Twitter for updates. Be sure to check back next week for a recap of the Lakeville North game, a preview of the Week 8 matchup against Eastview and a look at potential district and section scenarios. Taylor Smith can be reached at tay1@me.com or on Twitter at @taysmith2013. ©2019 Prior Lake High School Football / SportsEngine. All Rights Reserved.